"Where today’s students meet tomorrow’s opportunity"
Mission College is a public community college in Santa Clara, California. It is part of the West Valley–Mission Community College District. The land the college is on was bought between 1966 and 1967. Mission College opened for it first year from 1979-1980 with "3,500 students, 8 administrators, and 73 instructors". The 12 acres of land that was today's Mission College was bought in Santa Clara in between 1966 and 1967. Later, by 1970, 164 acres of land in total was bought and acquired. The first piece of the Mission College Interim Campus construction plan was completed during 1979, which is also the start of the 1979-80 academic year, which enrolled about 3,500 students, 8 administrators, and 73 instructors. The Mission College Interim Campus was renamed West Valley-Mission Community College district in September 1985. By that time, Mission College has prided itself for having a large diversity of academic learning approaches. The campus' architecture was also designed to increase interaction among its students and faculty, which results in a more effective learning environment. During Super Bowl 50 Mission College hosted rock group Heart. In recent years the college has hosted a number of speakers, including Pulitzer Prize winning author Sonia Nazario, Civil Rights activist Cornel West, Tuskegee Airman Les Williams, and former Santa Clara Assistant District Attorney Rolanda Pierre Dixon. The college's art department also hosts exhibits at its Vargas Gallery in the Gillmor Center. The Mission College Symphony is celebrating its 10th season in 2016-17. The Hospitality Management program runs lunch service on Tuesdays and Thursdays. Formerly called the Owl Cove, it is now called the Mission Bistro. The restaurant was renovated between 2009 and 2012. 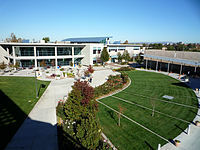 Mission College is part of Silicon Valley's West Valley–Mission Community College District, which also administers West Valley College in nearby Saratoga, California. It is part of the California Community Colleges System. The district serves the cities of Saratoga,Campbell, Los Gatos, Morgan Hill, Monte Sereno, Santa Clara, and San Jose. The district's headquarters are on the campus of West Valley College. The college originally was focused on a single large structure where most of the classes took place. In 2014, the Gillmor Family Center opened, with classrooms and labs on three floors. The library, cafeteria, and bookstore are in nearby buildings. A separate building houses the science departments. The Hospitality Management building includes the "Mission Bistro", which serves lunch on Tuesdays and Thursdays during the Fall and Spring semesters. The campus is immediately north of the Mercado shopping center and west of facilities of EMC and McAfee. The Campus is also located relatively close to Levi Station and Great America. In May 2014 the Gillmor Center opened, named after former Santa Clara mayor Gary Gillmor. The building houses 50 percent of the college's class room and is a LEED Gold Building. Gillmor was the City's first elected mayor and helped facilitate the land sale that eventually became Mission College. Its parking lot hosts 2,640 high-efficiency SunPower solar panels, which are estimated to save the college $9 million in the next 25 years following 2011. In January 2011 the school opened its new Child Development Center preschool. A new main building is under construction in 2017 and will be completed and open in Spring 2018. Mission College is reached from the California's Great America exit of U.S. Route 101. There are shuttles that are reachable with walks of a few blocks that connect to the Old Ironsides station of the Santa Clara VTA Light-rail, the Great America station of the Altamont Corridor Express, and the Lawrence station of Caltrain. VTA bus lines 57 and 60 stop in the college's front loop. While the new main building is under construction, VTA bus lines 57 and 60 stop in a section in the college's parking lot. Mission College has a variety of clubs: Alpha Gamma Sigma, Associated Student Government, Fire Tech Student Association, The Florets, Future Accountants of America, Kinesiology Club, MC Dance Company, MC Health Occupations Association, Mission Inter-Connect, Muslim Student Association, Puente Club, Umoja Community Club, Veterans with Associates. Mission college also provides various student services including Counseling, Admissions and Records, Assessment Center, Career Center, Tutoring Center, STEM program, DSPS, Veteran's Resource Center, CalWORKS program, EOPS, etc. Mission College has men's and women's tennis, women's basketball, softball, women's badminton, baseball. It began a new website in February 2017 at missionsaints.com. ^ "California Community Colleges Chancellor's Office - Data Mart". Datamart.cccco.edu. Retrieved 2017-04-04. ^ a b "Mission College General Information". missioncollege.edu. Retrieved 2017-10-26. ^ a b c d "Mission College : General Information : History". ^ "Super Bowl 50 events: Jan. 31 — Super Bowl teams arrive, Heart performs". Mercurynews.com. Retrieved 2017-04-04. ^ "November 2016 | Issue 46 | At Mission College: Pulitzer Prize-Winning Journalist Sonia Nazario Tells Story of Child Refugees". The Santa Clara Weekly. Retrieved 2017-04-04. ^ "May 2016 | Issue 19 | Civil Rights Activist Cornel West Speaks at Mission College". The Santa Clara Weekly. Retrieved 2017-04-04. ^ "March 2012 | Issue 10 | Tuskegee Airman Les Williams Speaks at Mission College". The Santa Clara Weekly. Retrieved 2017-04-04. ^ "March 2017 | Issue 11 | Mission College's African American Celebration Luncheon Recognizes Achievements of African Americans". The Santa Clara Weekly. Retrieved 2017-04-04. ^ "November 2016 | Issue 49 | Mission College's Vargas Gallery Flashes "Not So Heavy Metal II"". The Santa Clara Weekly. Retrieved 2017-04-04. ^ "October 2016 | Issue 41 | Mission College Symphony Kicks Off 10th Season with Intimate Mini-Concert". The Santa Clara Weekly. 2017-01-15. Retrieved 2017-04-04. ^ "April 2015 | Issue 14 | Culinary Students Manage the Mission Bistro". The Santa Clara Weekly. Retrieved 2017-04-04. ^ "May 2014 | Issue 19 | Mission College Dedicates Gillmor Family Building". The Santa Clara Weekly. Retrieved 2017-04-04. ^ "January 2013 | Issue 4 | Gary Gillmor Donates $250,000 to Name The Newest Building on the Mission College Campus". The Santa Clara Weekly. Retrieved 2017-04-04. ^ "November 2011 | Issue 48 | Mission College Unveils Solar Project". The Santa Clara Weekly. Retrieved 2017-04-04. ^ "January 2012 | Issue 4 | New Child Development Center Preschool Opens at Mission College". The Santa Clara Weekly. Retrieved 2017-04-04. ^ "Mission College Foundation". www.missioncollege.edu. Retrieved 2017-10-26. ^ a b "57 :West Valley College to Great America". Vta.org. Retrieved 2017-04-04. ^ a b "60 : Winchester Transit Center to Great America". Vta.org. Retrieved 2017-04-04. ^ a b c "Mission College : Statistics : Demographics" (PDF). Missioncollege.org. Retrieved 2017-04-04. ^ "Mission College ASG - Clubs and Organizations". Missioncollege.edu. Retrieved 2017-04-04. ^ "Mission College Student Services". This page was last edited on 14 February 2019, at 21:56 (UTC).